This funny magnet featuring Clara Francis is sure bring a smile to your face every time you see it on your refrigerator...or any other place that takes a magnet! This item is one, "Pilates? I Thought You Said Pie and Lattes." 4x6 magnet by Pugs and Kisses and Gretta's Girls. 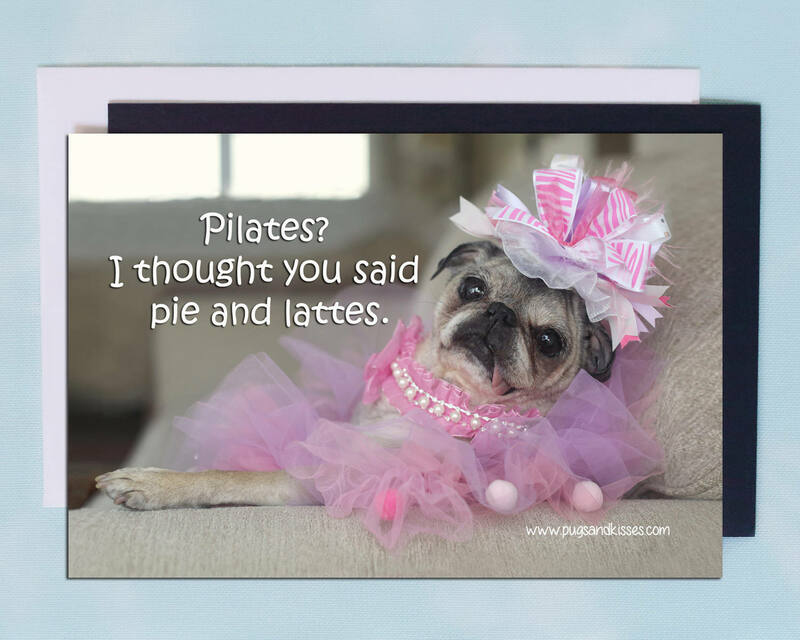 "Pilates? I thought you said pie and lattes." The magnet is 6x4 inches. It is beautifully printed, can be placed anywhere that takes a magnet and comes with a high-end, thick white envelope. Thank you for supporting PUG RESCUE!!! 10% of all proceeds from this card and all Pugs and Kisses® products go directly to helping pugs in need. We are especially dedicated to helping all senior pugs live out their lives in a loving and safe environment. Thank you for your help! Payments are accepted via Credit Card, Debit Card, or Etsy Gift Card. If you have a coupon code, simply enter it during checkout in the Shop Coupon Code area. Your discount will be automatically applied to your entire order. All items are shipped through the United Stated Postal Service using the most economical of the following services: First Class, Parcel Select or Priority Mail. All Gretta's Girls products are 100% guaranteed! We are dedicated to helping you enjoy shopping with us! Please contact us with any questions, comments, or concerns and will get back to you in a timely manner.